Betsy plays with one of her toys -- on one of HER two sofas! ...is actually a toddler's brush. Bright green with sparkles and a small head to fit in her mouth. So far we've used it twice and she is 9 1/2 weeks old. She is fascinated by my electric toothbrush, and apparently liked the smell of the dog toothpaste I showed to her. It was an easy matter to put the paste on the brush that I told her was her own.... She is a very inquisitive and adventurous dog, not timid or shy at all. That is going to make her precocious in some ways, but she will need a firm hand in other matters! I'm a big believer in spending minimally on dog toys, both because the novelty of any toy quickly wears off and because you get more variety if you assemble your own at home. This could be nothing more complicated than our latest favourite: a mesh shower ball (cheap and I happened to have one on hand) with my rather stretchy dressing-gown sash attached (I have other dressing gowns: it's fine for now). The result, as the pictures illustrate, is great bouncy fun. The ball and sash combo is wonderful for trailing, throwing, and bobbing over baby's head. It weighs almost nothing and is very tempting when you're about 9 weeks old. If she tires of this or I want my sash back, I can attach a different length of something else, or re-purpose the mesh ball in yet another toy/game. (I've never used it to clean myself with: it was a gift and has just hung in the shower stall as decoration.) Have a look at my Homemade Dog Toys & Games page for more suggestions about making your own fun. It's one sash: this iPhone picture makes it look almost like three! 2. Don't expect retrieval: the Boxer job is to find the frisbee/ball/bunny toy and stand over it so it doesn't get away. Retrieval is YOUR job. 3. Walks must be interesting in their own right or forget it. I have seen neighbours walk their dogs with a sense of duty and boredom round the block and a Boxer will simply not do that. Their attitude is: 'Show me the squirrel/rabbit/tortoise/waterfall/lake with birds in it or else don't bother'. Can't blame them, really. 4. You never have to insist. If you have to insist, grumpily, you aren't doing it right. 5. Play is the key to everything you want to instill. 6. Training is what you do to raise the Boxer: once raised, you can both nearly forget about it. 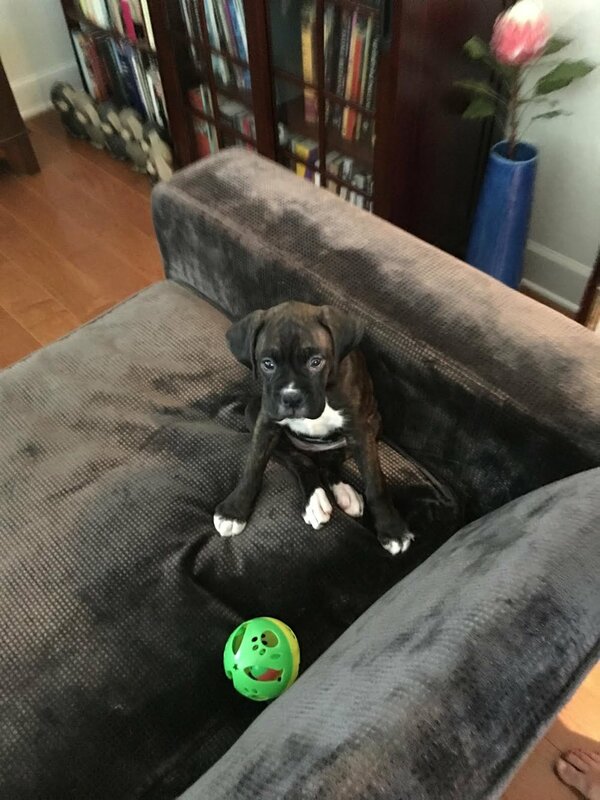 A Boxer dog really does grow up in the sense that you can dispense with most commands, most of the time -- we did. I so often see that the Boxer dog is the fourth-most, or ninth-most, or other-most liked dog within (or outside of) a country's rankings. And in a way, it's better that the breed stay a bit lower down, in order that it won't be over-bred, badly handled by unscrupulous breeders, or in any way undervalued. A Boxer is a beautiful mind, as well as a silky, svelte, and muscular body. A Boxer dog is not for everybody, since not everybody is up to the task and the sacred duty of giving that dog a wonderful life. I'll say it again: if you take a Boxer dog home, you have in your hands a sacred life. Live up to it: no god and no decent human will make excuses for you if you don't. I get an odd feeling when I see pictures of my darling dog in what proved to be her last months (or even days) on Earth. Here is one from last summer, where she is playing a chase game involving a cardboard roll stuffed with a paper bag holding a treat. Her nose is wet, her face is happy, she's having a lovely time. So missing her! I do and don't like the idea of 'owning' an animal. What I like is that it means you have complete legal right to live with the animal -- so long as you observe your moral duty to care for it. What I don't like is that animals are not handbags or benches: they cannot be indifferent to the question of who owns them. Yet a lot of people regard pet acquisition as a matter of checking off their own list of likes, set against another list of hates, as if it's all about them. They assess only the animal as a potential baby of the family; they don't really assess themselves as potential pet parents. Of course, parent- and home-assessment is the job of responsible breeders and animal-shelter personnel. But not every breeder really cares, and not all re-homings are well thought-through. So here is my checklist for potential owners. If any of these is a problem, you should wait for however long it takes until either your expectations and commitment or your circumstances change. Do you have a budget big enough to make doing the right thing unproblematic? Vet bills can be unexpectedly high for thorough, quality care. In my experience, the second-highest bills fall in puppyhood, on account of the vaccines and neutering/spaying that a puppy requires (and similar costs apply to a cat). The most expensive bills come in the dog's senior years, when more things start to go wrong and the consequences of not treating them become steeper. If you can't afford to pay the bills that keep your life hygienic and your pet's life comfortable and as healthy as possible, then now is not the time to get a pet. Are you healthy enough for the pet you want to keep? Some animals clearly require a good deal of physical engagement and fitness. Horses do; hamsters don't. Boxers do; Bichons don't. Be realistic about their needs and your energetic and attitudinal capacity to meet them. And then there is the question of longevity. Yours, not just the pet's. Are you going to be around 15 years from now for your cat? What will happen to the cat if you are seriously ill, incapacitated, or god forbid deceased in that time? No one can exactly predict the future, but if you can see a dark cloud on your health horizon, remember that it's not just your own life that's at stake. When the novelty or fun (or both) of having the pet deserts you, momentarily or for a longer time, do you have the commitment and devotion to stay the course, as you would for needy family members? I was given a lop-eared rabbit once, for Valentine's Day. It was a thoroughly charming and delightful gift, and for me as a student living out of one bedroom in a shared house, it was just as inappropriate. It would also have been wrong for me if I had been someone that travelled often, or was planning a move to a far-flung location. Pets, unlike children, are not easily portable. Having a pet affects what sort of holidays you can take, and whether you can stay in hotels or rent certain properties or not (animals are often banned, and that means you as well). Are you prepared to accept limits on your human freedom because you have a non-human family member? As animal lovers we have to be sure that this is the right place, and the right period in our lives, to bring a vulnerable animal into it. We have to be sure not only that they are right for us, but also that we have enough to offer them, now and for all of their lives (god willing). I was faintly appalled -- before I clicked off -- by a YouTube video in which the dog owner (I hate that word, but in his case it seems appropriate enough) makes his young dog go through a number of performances like a seal or dolphin at one of those aquatic parks, for the show-off value on a video. (I describe --and deride -- such a dog owner as The Show-Off, in my book, How To Train Your Human.) Anyway, I felt sorry for the dog. I noticed that the man had to reward with treats because the good feeling between him and the dog isn't enough, and also because there is no purpose to the commands. When I have ever given my darling commands -- and I rarely have to, these days, except for her own protection -- they have always had some sensible purpose or meaning behind them. I have never ordered her about just because I can. And that's what bothered me about this man's video. He wasn't respecting the dog and that dog's needs or the dog's perspective. It was all about him and his need to be Big Man On Campus. Oh, I feel sorry for dogs that must spend their whole lives in the shadow of shallow, vain people like that! This is why I say: don't teach your pup the 'Down' command, as this man did. I don't know why 'Down' is even suggested to new dog owners: it is utterly useless. There is no reason ever to put a dog in a position where it is vulnerable -- lying on its belly like a sphinx -- instead of sitting prettily. Everything you need, in terms of attentiveness, restraint, and reassurance of strangers, can be accomplished with 'Sit'. I started to teach my girl 'Down' as an inexperienced dog mum, and abandoned it quickly because a) I could see that she didn't like it and wasn't taking to it, and b) I was suspicious about its utility anyway. It was a good judgement call on my part, and she and I have never looked back. My thoughts have completely changed since my earlier idea of many months ago, through which I hoped to reduce Darling's weight by increasing the frequency of her meals but lowering her caloric intake overall. Whatever the intent was, the consequence didn't happen. She didn't lose weight, and I am not at all sure that she actually took in fewer calories. Not only that, but I am aware (as I should have been at the time, as I've known about insulin's effects from way back) that feeding frequently is likely to keep insulin boosted in the blood, which is not ideal. What one wants is a more occasional insulin release (from the pancreas), and a smaller insulin release in response to a less insulin-provocative food. The end result of all of this is LESS FAT STORAGE and healthier organs. So now we are trying a different way -- now that Darling is approaching 10½. I'm trying to get her to accept one main meal a day, with some snacks here and there, but a long fast after her last meal and before the next mini-feeding the next day. If fasts help humans lose fat, boost their growth hormone, and improve their endocrine system overall, why shouldn't they help dogs as well? Today's message is: if you have an older dog (or an injured dog, or one that is feeling a bit insecure or uncomfortable for any reason): bring the water to your dog, and bring the food. Leaving a comfortable spot, when the joints are achy, might seem like too much trouble to a senior dog. Especially if it's bedtime and the moment for getting one last sip from the bowl seems to have passed. If you think your dog could possibly be thirsty, bring the bowl to your dog. The same goes for meals. Many times I have failed to interest my 'senior' girl (now 9 1/2 years old) in her breakfast. But when I brought it to her place on the sofa, and wafted it under her nose, I got her to eat -- with accompanying noises of satisfaction. If you have an older dog that seems finicky, give it a try! I have visited this subject of pill-giving twice already, but it seems to be a sort of moving goalpost, so here are my two latest tricks. Sweetheart has a urinary tract infection (which we discovered when her urine emerged intermittently with blood). The vet prescribed antibiotics, which come in a tablet that looks like a large flattened aspirin. I was not overly confident about being able to give my dog these pills, four a day for two whole weeks, without her balking at them quite early on. The vet tried out two very large edible pill pouches in beef flavour, and these did the trick. If they hadn't, she suggested serving them up in a thick dollop of beef-flavoured baby food (which my girl sampled there in the office and apparently liked). If these items failed when tried at home, the further suggestion was butter: coating a pill in a layer of butter helps to prevent any bitter-pill flavour from being detected. Well, the pill pockets worked but we ran out of them. So I did the butter-ball thing, and that was all we needed. So if your dog is very clever about pills and doesn't want to take them, try coating each one in butter, then serve up in a stew or within the dog's regular meal. I did this (my girl is used to a lot of variety, so the presence of something new in her dish is not an automatic tip-off), and I think it all got accepted as food and thus there was no suspicious picking-through. A friend in England tells me that peacocks are fond of cauliflower. Who would have guessed? And apart from being beautiful, it's probably the only thing they have in common with my darling dog. This may seem strange to you and me, but it's one of the few vegetables -- along with peas, corn, and green beans, basil and parsley -- that she really likes. Raw carrots lost their appeal some years ago: she will only eat them boiled or roasted. Apples used to be liked, in puppyhood; now they are poma non grata -- unless grated and served with a meal. Lettuce is an alien non-food to her. Broccoli also raises no interest, even though we're told that it's the same species as cauliflower, differently cultivated. She'll eat it green, white, purple or orange, but cauliflower it must be. That brings me to my next thought, which is that when you have a dog, you develop funny unexpected habits. I'm thinking of the fact that I never, these days, just plonk down her meal (whether it's breakfast or dinner). I always announce it like a waiter: 'sardines with peanut butter and parsley'; 'fish with cheese and hot sauce', 'cauliflower cheese with chicken and hot sauce', 'egg with tallow, peas, and basil', 'tallow, chicken broth, and fish', 'yoghurt, gelatin, and beefburger', 'meatloaf!'. It's as if I've come to believe that the advert for the tastiness of what she is about to eat must be frank and enthusiastic. If it's not good enough to say aloud, in the slightly superior and triumphal tones of a posh waiter, then it's not good enough to serve in the first place! I have had a very kind offer, by a close relative, to look after my dog for the duration of any holiday we might care to go on, my husband and I. Now, this relative and my dog are very fond of each other: that is really not the issue. But even though this person has had dogs (two, into old age) in the long-ago past, there are things that she may not remember. And I think that, especially, when you are an older more fragile person (in body and perhaps in spirit too in some ways), certain aspects of dog-care may be more than you bargained for. For instance, my dog is now 9. That means that she is (like all of us that are not puppies) a little bit set in her ways. Perhaps the kindly relative likes her bed just so and her TV on loud (she's a bit deaf) and so on. But my dog likes bedtimes as we've always had them -- and that means sleeping in the bed with the humans. My relative has never done this before. What if she tries it and doesn't like it (the dog snores in the night, or her nails push in to the relative's flesh, or she takes up too much room, or leaves a lot of hair, or farts, as she probably will)? What then? Who should continue to suffer the consequences -- the relative or my dog? Then there is the fact that my dog is very healthy and active and needs walks and activities, preferably something that allows her to frolic. I don't think that Elderly Relative is really up for any of that. So we'd have to hire a dog walker, and this person would have my darling's life in her hands while they were out together, and as I don't know any dog walkers personally, I don't think I would be entirely comfortable with that. Also, being a rather senior dog at this point, and allergic to boot, my sweet girl sometimes does things that are not shall we say beneficial to the décor. While we were travelling this summer, she barfed once but somewhat extensively into the crevices of the back seat of our brand new car. That took a two-person effort at wiping, hoovering, brushing, and washing, let me tell you. Then there is the allergy-provoked incontinence. A full bladder's-worth of widdle on the floor (follow the puddles)? Our girl can do. To say nothing of the indoor sickness that doesn't always manage to avoid the rugs or my shoes or whatever else might be on the floor. How would Elderly Relative, with her immaculate rugs and sofas, handle that? And if my girl needed taking to the vet in an emergency at 2 in the morning, would my relative be up for that? (This is not an unlikely scenario. When my dog had a cough that wouldn't stop, some years ago, we felt that we couldn't take the risk of waiting and at 2 a.m. we were out on the town looking for the all-night dog doc. And of course, as soon as we got there, the coughing stopped!) Even on our most recent summer vacation, we had an unexpected visit to the vet when we spotted blood drops on the carpet that had come from her tail. She also recently had an eye cloud that bloomed within a few days into a serious eye ulcer (the latter detectable only by doctor's examination). Would Elderly Relative notice problems -- and react -- as quickly as we do? Conversely, would she overreact, putting our dog through all kinds of tests that she really didn't need -- and hated? This is just the prosaic stuff, of course. There is also the emotional connection -- the fact that I can know what Chummy needs by just glancing at her; that I am inclined to put myself out for her benefit; that I am willing and happy to pamper her. I know her, as much as anyone can know a darling of another species. I would risk myself to save her life, but Elderly Relative would not. And then too there is the simple fact that no one but Mummy and Daddy can be Mummy and Daddy. We are simply the two people in the world she loves the most. And if we left her, she might easily believe that we were never coming back.